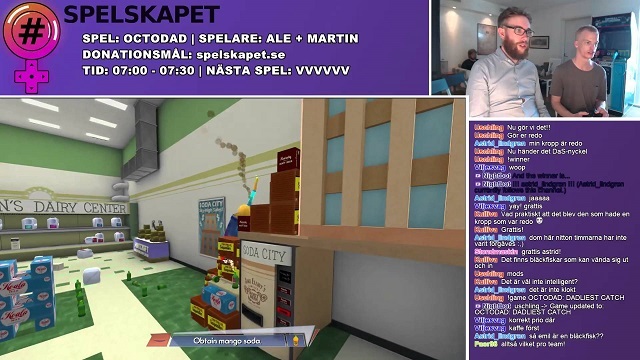 The following blog post, unless otherwise noted, was written by Michael Andersson and outlines his thoughts on the charity initiative – Spelskapet which is set to return for its second run at raising money for worthy causes! Spelskapet started out with a handful of us just wanting to do a games streaming marathon sort of in the spirit of Games Done Quick. Kawa (Zolfagary) had been doing small streams of Dark Souls 2 and we all thought it would be nice to do something bigger. Since we all live in different parts of Sweden we rarely get the chance to meet up and this was the perfect excuse for us to hang out and play games. After a while the whole thing started to grow. We had more and more people wanting to play on our stream, people from games studios like Fatshark (and especially Johannes Wadin helped us a great deal) which made Spelskapet grow bigger than we actually ever had imagined. From being just a couple of friends hanging out, streaming games, and making bad jokes we grew to become a real event and when we realized we had this chance to make something real out of it we decided to act on it. Playing games is a human thing. We all do it in one way or another. However, the video gaming community has been excluding people from it. Videogames often use old western tropes that are full of sexism, racism, HBTQ-phobia, etc. Although this is not limited to videogames and as usual in videogames as in all other forms of cultural expression, videogames are a social activity. The interactivity in videogames makes them special and it’s a shame if the possibility to interact with people from everywhere in the world would be limited by games scaring potential gamers away. Since we’re not part of the games industry we cannot change the way games are made, but we can change the way we interact with each other through games. The gaming community can be really awful and vile. Racial abuse, sexism, and homophobia is hurled at everyone, everywhere and often. If the games do not scare away the potential gamers, the community often does. Being part of the community and having the chance to create a fun, inclusive, diverse and open community we had to take it. Our first event was held in Kawa’s home in Stockholm. For 24 hours we were a lot of people with really diverse backgrounds cramped up in this two room apartment playing games, eating pizza, making jokes and discussing things. We had Ale. who is a doctoral grad student in history. play Papers Please! while talking about borders, nations and colonialism. We had Kawa playing Angelica Norgren, a journalist from P3 spel, talk about games journalism while slaughtering hordes of zombies in Left 4 Dead. My favourite moment was when Emil played Long Live The Queen and Amina (this week’s @sweden!) and Samantha was riffing hard on him for being a gigantic nerd who’s playing a visual novel at 6 o’clock in the morning. During this time we also managed to raise over 25000 SEK for the women’s shelter Terrafem. Now we’ve been planning and putting together Spelskapet 2: Safe Space Jam. We’ve worked really hard on making this into a real event. First of all we’ve partnered up with Webhallen.com, ABF, Flumskolan and Inferno Online to be able to make it into a even bigger event. We’re still looking for people and companies to help us out and make it better, but so far we’ve managed to book the biggest E-sport arena in the nordic countries and the event will be 40 hours long this time. The event will be held from the 8th to the 10th of may, starting at 20.00 CET on Friday the 8th and ending at 12:00 AM on Sunday the 10th. Our goal this year is to bring a bigger, longer and better event while raising money for charity. The 40 hour stream of the event can be viewed in its entirety on Twitch.